← The humble Humbug Bag! 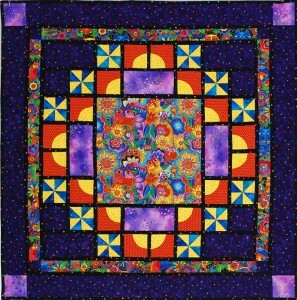 Do a "Moon Dance" in your sewing room! 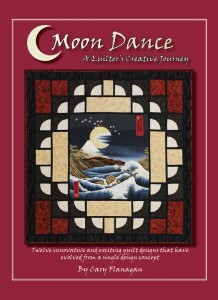 QuiltWoman.com is proud to announce the publication of our newest book, Moon Dance, written by Cary Flanagan. This book’s inspiration was Cary’s Moon Glow pattern. Moon Glow was created out of a desire to showcase large scale fabrics that one couldn’t bear to cut up. The pattern proved to be very popular, and as a result, Cary started playing the “What If Game.” What if this was changed or that was changed? And thus the book Moon Dance was born. The book contains twelve innovative and exciting quilt designs that evolved from the the concepts Moon Glow was created from. These designs include 11 quilts tops (including the original Moon Glow that started it all, plus a design that can be used for a bag front or a pillow top. When I initially picked up the book, my first question was “How does Cary do those blocks with the semi circles, the moon blocks?” Cary says “The method I present is meant for quilters who are not very experienced in sewing curves( a method that required lots of pinning). ” Phew, I’m covered! Instructions are important in any how-to book. And the instructions in Moon Dance are more than complete. They are clear and concise, and come with loads of details and assembly diagrams (always a big hit with me). The book’s 91 pages contain not only directions for all twelve designs, but also contains hints, tricks and tips. For example, Cary provides instructions on making a design wall, fabric selections, teacher tips and more . 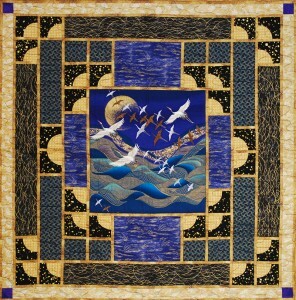 Also included are a gallery of quilts made using her designs. These will send you to the moon (pun intended). So if you are a confident beginner or better, this book could provide you with your next project. Dig through your stash for that great looking fabric you have been hoarding because you couldn’t stand to cut it up. Now’s the time to do something with it! You can buy this terriffic book now from QuiltWoman.com. This entry was posted in patterns, Publications and tagged Cary Flanagan, Moon Dance. Bookmark the permalink.